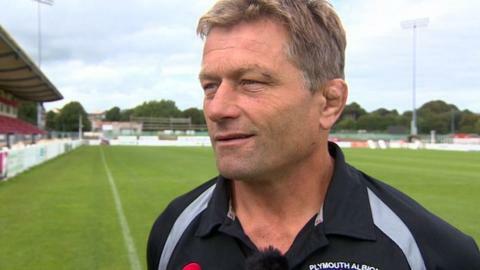 Former England international Graham Dawe says he has resigned as Plymouth Albion's director of rugby at the request of the club's new owners. The 56-year-old took charge of the side for the second time in April 2015. The National One club were taken over by former players David Venables and Bruce Priday last week after entering administration. "I have been asked by the new owners of Plymouth Albion to step down immediately," Dawe said in a statement. "I met with Bruce Priday and Nigel Sparrow yesterday for the first time where they informed me I was not part of their current plans as they wanted a fresh start. "I was willing to listen to them before making any decision on my future but they had already made their minds up on the direction they wanted to go in." Albion, who were relegated from the Championship last season, had slim hopes of promotion until their 30-point deduction from the RFU. Despite that, the Devon club are 10th and safe from another relegation. "It is sad for the players that the new owners want to make these changes now with two games of the season still to go," added Dawe. "The players were very frustrated over losing 30 hard-earned league points for going into administration, but were told it was for the good of the club moving forward. "I hope the club can move forward. Plymouth Albion will always hold a special place in my heart and I know I have always done my utmost for the club." BBC Sport has contacted one of the club's directors, who is currently refusing to comment.